Like many people with autism, Andrew D’Eri had a hard time finding a job. Then, his father, a veteran entrepreneur, and older brother, who had recently finished business school, had an idea: What if they opened business employed mostly by people with autism? “We wanted to build … an example big and bold and out there that other companies could go ahead and want to emulate,” Andrew’s brother Tom D’Eri, 25, told ABC News, adding that they wanted to find a business that would educate the community by putting autistic employees in front of the customers. 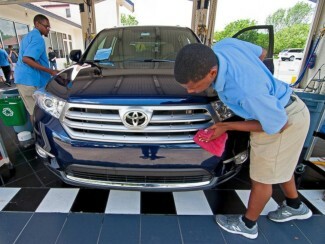 They opened the Rising Tide Car Wash in Parkland, Florida, in 2013, and today they employ 35 autistic men and women!